“When you feel good about your hair… You Radiate Beauty and Confidence”. Book a free consultation today! Why Raquel wigs are different? Hand crafted with only the finest certified Remy Hair, this line is one that is often used in the movie and television industry. Constructed meticulously with the new pinnacle cap, it delivers incredible comfort and a flawless finish giving the ultimate experience wearing wigs. Today, if you are suffering from hair loss, you can have incredibly natural looking hair, so unlike the wigs of 20 years ago, In fact many women wear the Couture by Raquel simply for the incredibly beautiful and stylish hair it provides. Couture by Raquel wigs The Couture line is designed for extreme comfort, and is an excellent solution for conditions of Alopecia, Chemotherapy hair loss, Trichotillomania or advanced thinning hair. At du Brule Hair Clinic we are very proud to carry the incredible, sought after Raquel Couture Wig Collection. Today, if you are suffering from hair loss, you can have incredibly natural looking hair, so unlike the wigs of 20 years ago, In fact many women wear the Couture by Raquel simply for the incredibly beautiful and stylish hair it provides. 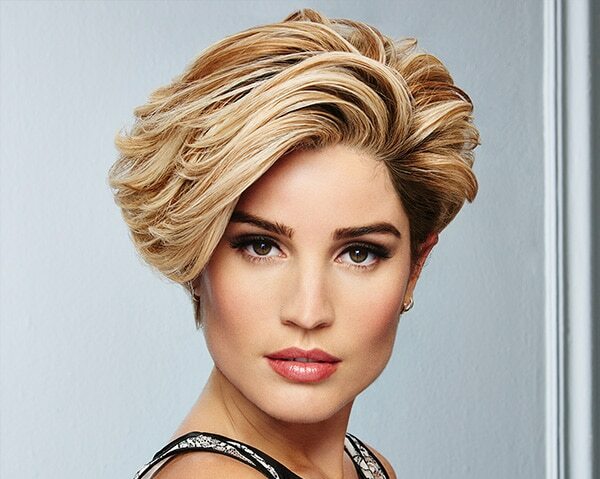 Couture by Raquel wigs are available in over 70 colors and a wide range of popular trending hairstyles. The Couture line is designed for extreme comfort, and is an excellent solution for conditions of Alopecia, Chemotherapy hair loss, Trichotillomania or advanced thinning hair. Make your appointment today with us for a private consultation. We can help you to choose the best Couture product for you and your lifestyle. Couture wigs can be chosen with your color and desired style, or they can be cut and styled by one of our senior stylists to create your very own look. The options are limitless! If you are experiencing the devasting effects of hair loss, please know you’re not alone. Du Brule Hair Clinic helps many women just like you. Losing your hair can be devastating and a huge impact on how you feel. We want you to feel beautiful again. Our collection of beautiful, extremely natural-looking products are the preferred choice thanks to their exceptional comfort, quality and modern styling to give you that beautiful look that we know you will love. *Your purchase may also qualify as a medical expense and possibly covered by medical insurance. We can provide documentation for this provision. There are so many ways we can help! Trichotillomania (TTM) is not a very well known disorder, but if you are affected by it, it can be devastating. Trichotillomania or “hair pulling disorder” is classified as an impulse control disorder which involves a person pulling out their own hair, from the scalp or other parts of the body. This pulling can result in bald patches on the scalp or body but when it is done to the scalp, it can create more stress and shame which can fuel the impulse to pull even more. At duBrule Hair Clinic, we are very familiar with and have the experience of treating many clients with TTM. We know it can be embarrassing to go to a hair salon, to get the questions or the looks. So much so that you may even avoid going out to get your hair cut at all. But then what are you to do? Come see us at du Brule Hair Clinic. We invite anyone with TTM to feel comfortable to come to us for any of hair services. We offer private rooms for discreteness but just as important, we offer we understanding, compassion and acceptance that will facilitate a positive hair salon experience. And if you are needing more help than just haircuts, we are here to provide beautiful natural hair prosthesis, to help you restore your appearance improving self-esteem and self confidence. When you are given the diagnosis of cancer and chemotherapy is required, this is an incredibly traumatizing and devastating experience. What exacerbates this is that chemotherapy often causes hair loss. At du Brule Hair Clinic, we see the devastating effects chemotherapy can have and we strive to help by giving you beautiful natural feeling and comfortable hair so you can look beautiful throughout this difficult time. Our hair prostheses are specifically designed for the sensitive scalp during chemotherapy. They are ultra-light, reducing itchiness with plenty of breathability. All our services are in private spacious rooms for you and anyone you may want to bring with you for support. And we want to be there throughout your treatment with follow-up styling sessions to ensure you are feeling your best! There is good news. Hair loss due to chemotherapy often starts to grow back once treatment ends. So when your treatment is completed and your hair begins to return, we will help you transition back to your natural hair. We also carry specialized treatment kits for pre and post chemotherapy. These kits are very helpful throughout the process as they include a shampoo specifically created to be very gentle for sensitive scalps, and spray on lotions ideal for promoting hair growth by aiding cell formation, protein and essential vitamin enrichment proven to aid in new hair growth. This is a difficult time. We hope we can be there to help you feel and look the best you possibly can and at least take one worry away.